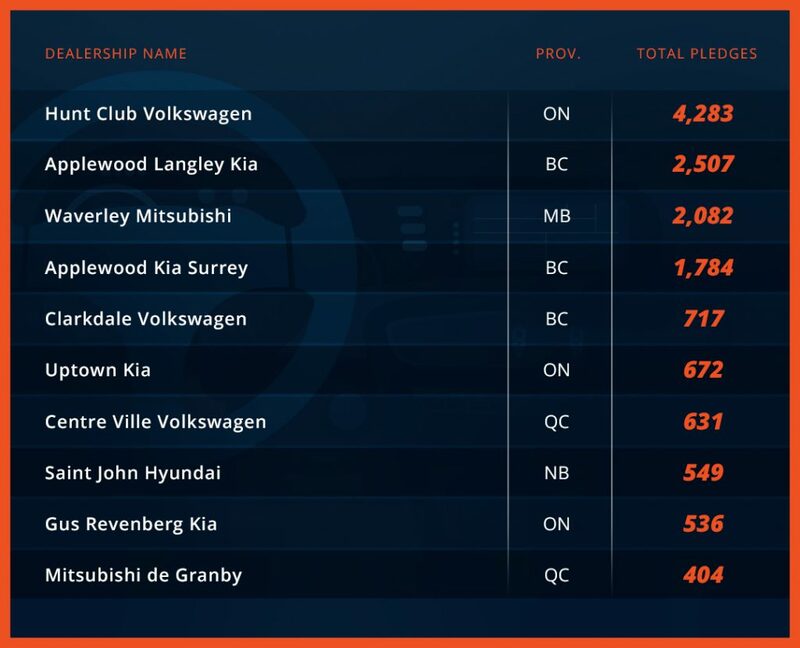 Dealers across Canada banded together to collect a record-breaking 27,850+ pledges against distracted driving as part of the fourth-annual Auto Dealers Against Distracted Driving Campaign. The month-long awareness campaign once again surpassed all expectations, with an impressive final pledge count of 27,850 – surpassing our goal of 20,000 pledges with flying colours! Throughout the month of March, participating dealers educated their customers on the dangers of distracted driving and encouraged them to make a formal commitment to drive distraction free by pledging in-person at the dealership, or on distractionfree.ca. Congratulations to everyone on another fantastic campaign! You left your mark on 2018 and should be proud of the positive impact you made in our communities. March may be over, but the impact of the participating dealer’s commitments to drive distraction free will be felt year round.